Genetic engineering is the human altering of the genetic material of living cells to make them capable of producing new substances or performing new functions. The technique became possible during the 1950s when Francis Crick (1916-) and James Watson (1928-) discovered the structure of DNA molecules. Crick, Watson and later researchers learned how these molecules store and transmit genetic information. DNA (deoxyribonucleic acid) is found in the nucleus of all living cells. It is structured as a double helix, with two twisted strands parallel to each other with rungs like a ladder between the strands. Each strand consists of four chemical bases: guanine (G), adenine (A), thymine (T) and cytosine (C). These bases are repeated in particular arrays of sequences throughout the DNA molecule. The patterns they create provide the instructions on how cells will develop and what their tasks will be. DNA is packed into structures called chromosomes within the cell. Genetic engineering allows scientists to identify specific genes, remove them, and clone (duplicate) them and use them in another part of the same organism, or in an entirely different one. For instance, cells of bacteria colonies can be changed by genetic engineering to produce proteins, hormones or other substances that may be useful in treating illnesses in humans or other animals. This process is called gene splicing or recombinant (as in recombining) DNA technique. Genetic engineers can also increase the amount of certain antibodies for treatment by using hybridomas (altered rapidly growing cancer cells and cells that make antibodies) to form monoclonal anti-bodies. They can also use the polymerase chain reaction technique to make perfect copies of DNA fragments from very small samples so that the origin of the substance (hair, blood) can be identified. This procedure is used in DNA fingerprinting in criminal cases. Although the structure of DNA was discovered in the 1950s, it was not until the early 1970s that scientists figured out how to clone and engineer genes. The first experiments were done with simple organisms such as bacteria, viruses and plasmids (rings of free DNA in bacteria). Hamilton 0. Smith, Daniel Nathans and Werner Arber were the first researchers to realize that the bacteria made enzymes, called restriction enzymes, that would "cut" DNA chains in specific places. The scientists could then use these enzymes to cut the DNA into segments, cut out a segment that gave disease-causing instructions, and replace it with a segment that gave correct instructions for healthy functioning. One could also use this technique to alter a bacterium to perform a certain function (such as making insulin for sugar metabolism) and then reproduce itself many times to provide this hormones for treating diseases such as diabetes. There are limits to this ability, however. Scientists must start with a complete organism, and cannot change everything in it. They can only make a limited number of changes, so the organism can remain essentially the same. Our knowledge of the total genetic code for humans, which contains millions of patterns is limited, so we cannot transfer complicated traits like intelligence, which are a mixture of genetic and environmental influences. One of the most exciting potential applications of genetic engineering involves the treatment of genetic disorders. Medical scientists now know of about 3,000 disorders that arise because of errors in an individual's DNA. Conditions such as sickle-cell anemia, Tay-Sachs disease, Duchenne muscular dystrophy, Huntington's chorea, cystic fibrosis, and Lesch-Nyhan syndrome are the result of the loss, mistaken insertion, or change of a single nitrogen base in a DNA molecule. Genetic engineering makes it possible for scientists to provide individuals who lack a certain gene with correct copies of that gene. For instance, in 1990 a girl with a disease caused by a defect in a single gene was treated in the following fashion. Some of her blood was taken, and the missing gene was copied and inserted into her own white blood cells, then the blood was returned to her body. If—and when—that correct gene begins to function, the genetic disorder may be cured. This type of procedure is known as human gene therapy (HGT). Genetic engineering also promises a revolution in agriculture. It is now possible to produce plants that will survive freezing temperatures, take longer to ripen, convert atmospheric nitrogen to a form they can use, manufacture their own resistance to pests, and so on. By 1988 scientists had tested more than two dozen kinds of plants engineered to have special properties such as these. Domestic animals have been genetically "engineered" in an inexact way through breeding programs to create more meaty animals, etc., but with genetic engineering, these desirable traits could be guaranteed for each new generation of animal. 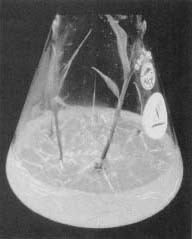 Plants are genetically engineered in a laboratory beaker. Genetic engineering promises a revolution in agriculture. The potential commercial value of genetically-engineered products was not lost on entrepreneurs (business starters) in the 1970s. A few individuals believed that recombinant DNA would transform American technology as computers had in the 1950s. In many cases, the founders of the first genetic engineering firms were scientists themselves. They were profiting from research that was originally paid for in large part with government funds. As a result, some have questioned whether individual scientists have the right to make a personal profit from these techniques. As of the early 1990s, working relationships had, in many cases, been formalized among universities, individual researchers, and the corporations they established. But not every-one is satisfied that the ethical issues involved in such arrangements are settled. Many critics also worry about where genetic engineering might lead. If we can cure genetic disorders, can we also design individuals who are taller, more intelligent, or better looking? Is that a good application of the technology? Will the altered agricultural products be safe for humans, or will they change us in some unknown way? Will the altered bacteria used to create synthetic versions of substances such as insulin create new bacteria that are harmful to humans? Will humans know when to say "enough" to the changes that can be made? These are some of the ethical questions that surround genetic engineering. Many other applications of genetic engineering have already been developed or are likely to be realized in the future. In every case, however, the glowing promises of each new technique are balanced by the new social, economic, and ethical questions that are being raised. my name is kidist and im doing a reaserch paper on this topic and i was wondering if anybody who comes to contact with this eamil can eamil me regarding the controversy against this issue. I would appreciate it if you guys can fill me with litle information. please fill free to email me back. i am looking forward to a carrer in genetic engineering. i have a few questions and if someone with experience in this field please give me an email. my first question has to do with the effects on organisms and single cells that have been genetically engineered. i am looking towards a carrer in genetic engineering or other things. i have a few questions and if someone with experience in genetic engineering could help me with a couple of questions. my first question is have they ever done it o humans. this is a weird questin but could they put wings on humans by genetic engineering i know it sounds weird but in a science lesson i was thinking about it. also all those millions of codes in chromsones could you find ones in muscle cells and change parts and put back into humans. hi , i really loved the article and i was wondering if i could have more information about the genetic engineering application? I love the way how all the facts are presented in an unbiased way. i like your article alot as it contains valueable information on the applications of genetic engeneering especially in humans and plants. well i want some information about the history of genetic code and also about the latest researches going on genetic code if there is any information than mail me i will b really oblige..and secondly i will appriciate u becz this site contains pretty gud information..keep it up!!! Amazing article. Keep it up. The information is well thought out and conveyed in an articulate manner. would you say that the contents of your scientific studies involving human genetic engineering will ultimately lead to a new form of personal genetic modification.as in many countries physical modications taken on by individuals ranges from socially acceptable to ethically bizzarre as in body modification.and if so do you think it would be ethical to market personal individual genetic modification to the general public? You can contact me through my email. i need information on how gene splicing relates to the 1970's and how it relates to the scientist B.F. Skinner and Nasa also in this decade for a chemistry project, any help would be greatly appreciated. I am currently a high school student at The Science Academy at STISD. I am currently taking a class called BioTechnical Engineering. I was wondering where there is a good collection or source of mabye current projects in the feild of genetic engineering. Also is it possible, at least in therory, to alter massive amounts of genetic codeing to,for example, to change personality, thinking, or even major physical changes like giving people wings, fur, tails ect. And one last thing. Would it be possible to change the genes of a person so, that over a period of time, change their fingerprints? Hello, I'm a senior at Harnett Central High, and my classmates and I are doing research papers on topics of our choosing(from a list chosen by the teacher, of course). I would like to ask you a few questions. Would Human Genetic Engineering have a good application in warfare? Would it be possible to use a super computer to map the human genome? Can genes in animal DNA sequences be planted into Human DNA sequences? Would the cost be high to provide Gene Therapy using Genetic Engineering for every day people? (My questions randomly popped into my head). When they spice a gene or alter a cell they often show a video of a needle puncturing the cell and removing/altering the applicable parts. How can they make a needle so small (smaller than a cell itself), and how do they get someone with a steady enough hand to perform this procedure? I would thing that even a persons pulse would be enough to cause problems on this small a level. One more question on this topic. Once the cell is modified how do they put it in the person? Is it injected? Swallowed? If this is just one of the many billions of cells in the body that grow and die daily, how does this one cell among billions take off and multiply to form a critical mass to do what the scientists want it to do? To the others writing on this posts. If you want to be genetic engineers your first objective should be to write clearly and spell check and proof read before hitting send. well, it's extreamly good aricle, so i wanne know how it is possible for human colony and how does it function? hi, also would like to know if it's possible to alter genes in humans to give animal like features. If possible id love to even offer myself as a test subject. Very informative, I used this as a source in my last research paper regarding GE. There is a ton of promise in this field, I'm looking forward to the future because of genetic engineering! I'd like to know more about possible gene splicing with animals for enhanced senses and reflexes. If I could get an e-mail with any information on this subject would be appreciated. Can the DNA in blood be used for cloning? If yes, are there special procedures used? If no, thank you for your assisance. Hi, I would like more information on this please e-mail me. is it possible to splice two animals together? for example a frog and a mouse. if so how could you do it? Is it possible that you can change how the body functions like change how they look? hi my name is Athrun Springfield and i was wanting to know if it was possible to cut part of my DNA chain and insert a small amount of avion DNA in the my DNA chain. If you could send me an e-mail letting me know if it is possible, that would be greatly appreciated, thank you very much. Can gene splicing and cloning be used as one? It probly is a reduntant question (as the information is probly there) but I may have missed the information stated. More information/answer to my question would be useful. got a question, would it be possible to changeor combine animal dna to a living human? if so how can i do it? Cloning a human is very possible. All you need to do is get the sperm or egg from the person you want to clone and get either sperm or egg but have the dna removed from them. This will create an exact copy of whomever you want to clone except for the memories. If you wanted to have any adition parts ( eg gils or wings ) You would have to insert The genetic code for the "part" you want but then you would also have to create new genetic codes so that they would work ( eg a fluid sack for the gills and a bone structure for the wings ). Cloning is expensive though and with most of the technology we have now addings wings to a human is extreamy expencive and impossible at the current time. i think westop doing this application of biotechnology or else we might regret it someday..
Is it possible that the DNA of an animal was mixed with that of a humans? Would it ever be possible? Hi, im a student at Emory here in Georgia, and since i was about 12 ive been working on how to graft bird wings onto human backs. I think ive figured out all of he easy parts, but what Id like to know is how would i grow the wings to be big enough for a human, and do i need permission from the goverment? Like i said, once ive got the wings and the person, i know how to graft them together. If you could email me, thatd be great. Thanks! In medicine, part of a human gene is taken out and inserted into a bacterium. It duplicates and eventually makes insulin. This benefits diabetic people and has helped create medicines. In the environment the organisms are artificially changed, using genetic engineering, to benefit their surroundings to help maintain the area. In agriculture plant life is changed to be more resilient to insect and disease as well as have the help of the microorganisms helping support it and bringing it protein. Does anyone else have any other uses of genetic engineering? I with so many of the others am interested in splicing animal geenes into my body. To be more specific I am interested in splicing bear dna into my body. I was curious as to what the consequences of this could be positive and negative. Also I am interested to know if any programs exist for testing on willing test subjects and if so what are the names or contacts for these programs. Thank you im hoping I get some response. If anyone actully manages to get wings big enough to graft to a human, you got yourself a test subject right here. P.S. I am being comletely serious! Just like around 40% of this group, I have always wanted avian DNA injected into me. And just like about 15% of that group, I would totally volunteer myself to get my very own wings. ALot of the 40% don't realize the actual issue of getting wings, though. Even if somehow you get them, You wouldn't be able to fly due to your bone structure. Even with hollow bones, you would not be able to get high because of thin oxygen. Real birds have air sacs that allow them to breath it. AND if you got air sacs somehow, you wouldn't have the vision to see what's below you. Unless you fly extremely low. As much as I want wings, the reality of it is supernatural. im from Malaysia and am doing degree in biotech. i found this article very interesting. pls give me more information and any recent news that u hav. pls email me. thanks in advance. I have some ideas about using stem cells, DNA cellular 'switches'(bio-clock), paramagnetism, and recombinant splicing using existing patterns that I'd like to discuss, please email me. hello i was wondering if there are any scietists out there who know how to graft wings on to a human so they can fly because i have been dreaming of having wings since before i can remember so if you could plz email me i would be very gratefull my perfred wings are red tailed hawk u now have a willing subject (if i come out alive) and plz add stuff that would make it easier to fly extremly high THNAK YOU!!! you know iv always seen the imperfections in humans and other living organisms and for a long time now iv wanted to fix some of these imperfections such as the human immune system. i mean what if we could edit the human genetic code to form a better immune system that would basically make us immune to just about any disease and the ones that we wouldnt be immune to we could have a chance to fight off and even grow immune to that as well. but believe me thats just one of the many ideas that me and probably many others have thought about its very interesting to think about and how that would be possible. but its those kinda thoughts that have really got me into this type of stuff but seriously im 13 haha so this article was pretty helpful in the sense that it helped me understand what genetic engineering really is. cant wait to learn more, but hey maybe genetic engineering isnt the field of work that will help me do what i wish to accomplish but i think it fits the profile :). My name is john , i'm like to know more on human genetic reproduction of teeth. None of you get to fly. Have a good day. On a more realistic note, i am curious if anyone here knows of a good article on the gene splicing of fish. I would like to know if a human being could be engendered to breath under water, just curious. this is very helpful God bless you whoever wrote these article.